Designing, templating-patterning and fabricating of these dodgers can be tricky depending on the height, length and width. For the racing sailor they are ideal offering protection for foul weather and ease of access to the lines when racing. These dodgers are designed with a folding arm that tensions the canvas into place. Available with grab rails and leather trim we can colour coordinate the dodger to match existing canvas or design a new suit of canvas for your boat. 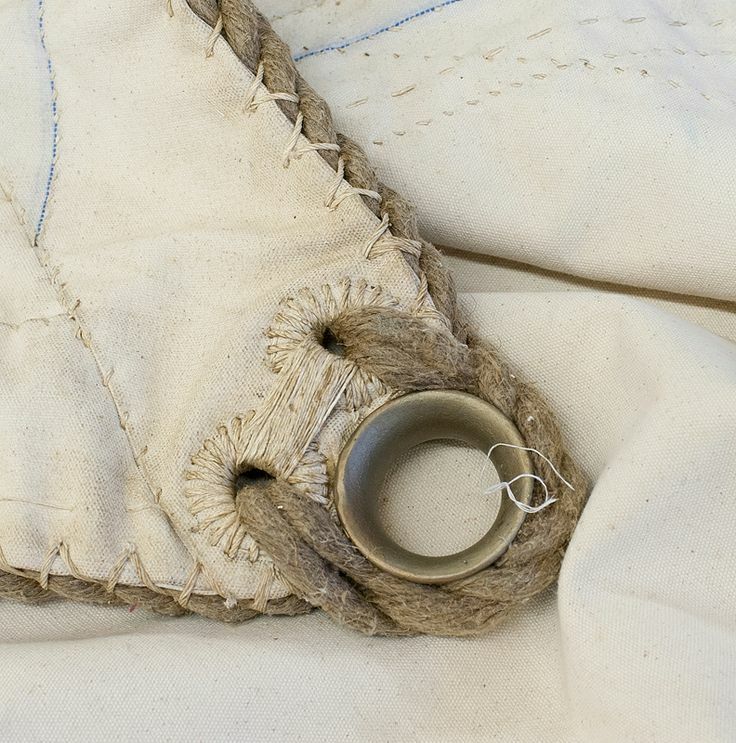 Precise and exact stitching finishes the work perfectly. These dodgers are the bench mark for dodger design. If designed with a rigid strut in the front only the aft of canopy section will fold forward. this enables the use of poly-carbonate glass to be used for ultimate visibility. However, for those client who would like to have the dodger fold down completely as I did for a director of Price Forbes we elbow the front strut but the glass needs to be strata glass or the equivalent. Boots can be made to cover the fold down convertible tops. When designing the rigid dodger the height is the most important factor. You need to take into account the owners height so that he/she can see under or over the dodger. These rigid designs lend themselves to using a poly carbonate glass which can be stitched into the canvas. for more solid glass choices the glass can be laminated and heat formed into shape. For this you require an ultrasonic polymer welder designed for the materials you are using. Standard rigid dodgers are entirely stitched and use support struts in the front as well as horizontal struts between the front and aft bows. These struts can be designed to function as grip holds or as handles. 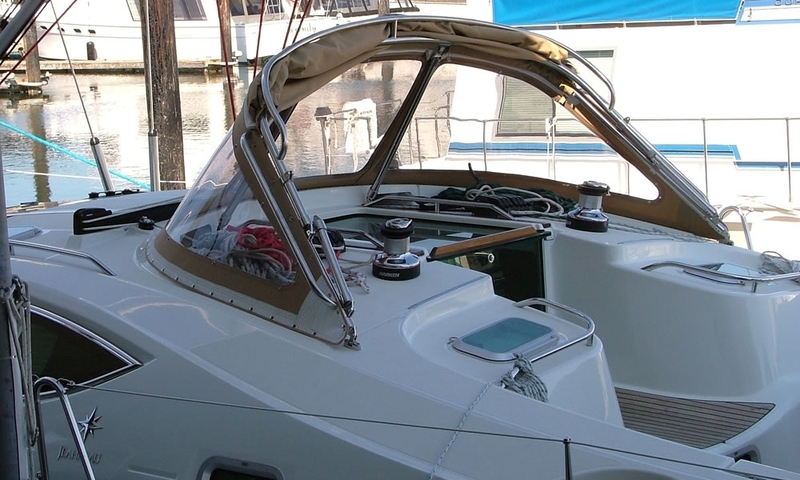 Aft grab rails can be attached with joints or welded for ultimate strength. I have put boom cradled on these designs as well. 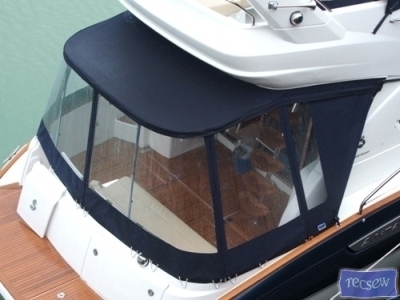 The rigid dodger can totally finish the boats lines and offer the perfect protection from the elements. I will not go cruising without one. Had top Dodgers are the next step from rigid canvas designs. 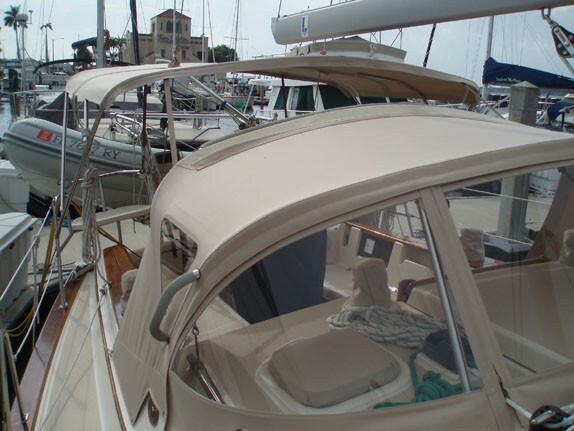 They offer the structural integrity to stand on whist still enabling the removal of the front and side panes and at the same time offer a rigid coach roof to add a track for a water tight seal to connect a bimini for enclosure purposes. 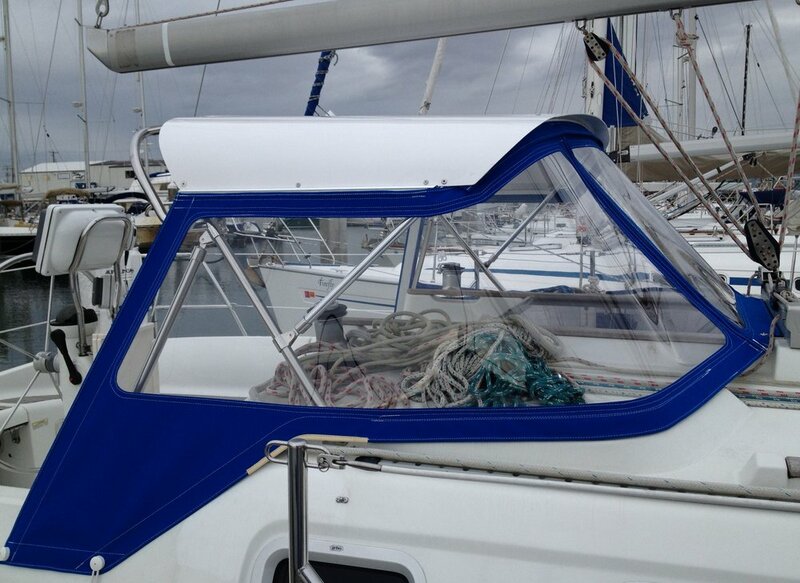 The hard tops are also ideal to attach solar panels boom cradles and hand grips. Using zipper tracks enable quick and simple side and front panel rolling to maximize air flow for the tropics. The design of the hard top may include Lewmar hatches and lighting. I have created hard top with molded ceiling mounted instrument boxes for electronics which keeps the cockpit clear to operate the winches and organize your running rigging and lines. Lighting fixtures and speakers with fold down flat screens are all an option with the hard top. Let me know what you would like in your bucket list and we can include them in the design and fabrication. 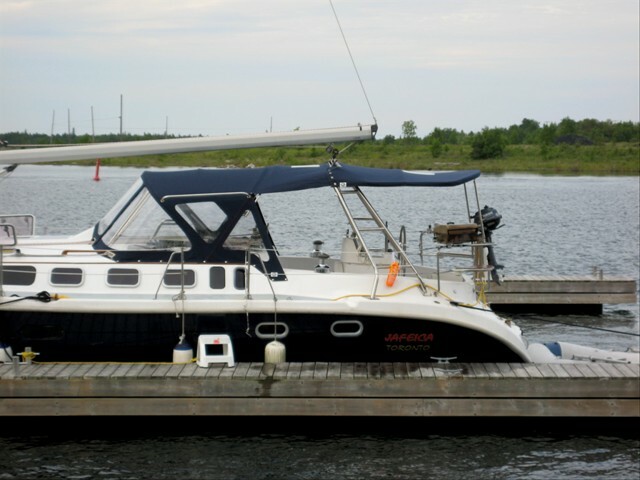 The rigid dodger is a structural piece of engineering that is an integral part of the boat. For this one needs to take many factors into consideration. Height, width, length and then all the features one would like to include. The rigid dodger is what we has circumnavigating the world. Probably the most important feature of the rigid dodger is the aesthetic quality. As this is now a permanent part of the vessel the design, lines and functionality really have to be looked at carefully. 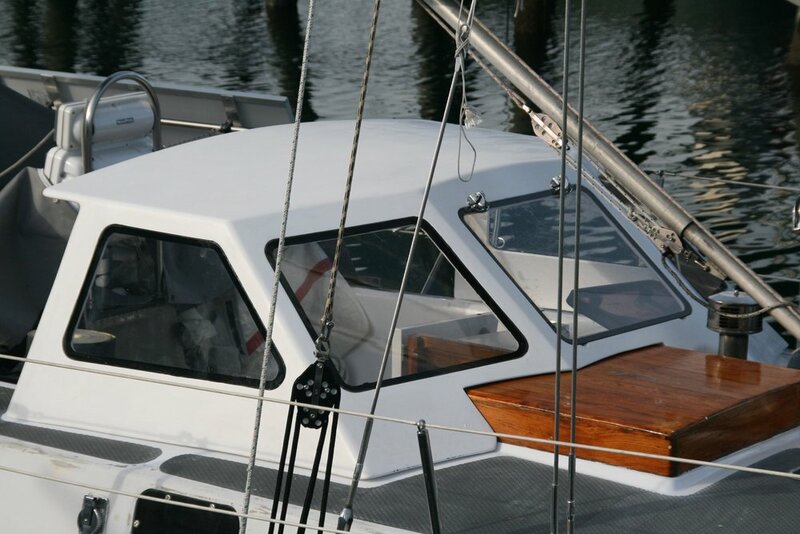 Whether you are using aluminium window frames or a wood- composite recess into which the tempered shatterproof glass is inserted the over all appeal needs to follow the lines of the boat. Adding hatches, hand grips and main sheeting track are all possible. The addition of a main sheeting track means that the structural integrity of the main arch needs to be supported with an aluminium frame. This in turn presumes the addition of composites glassing. 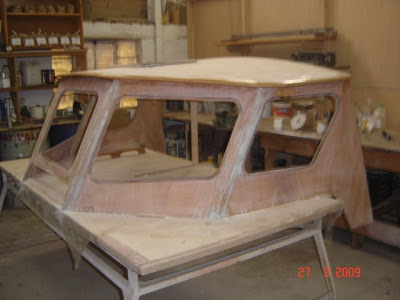 Where I have done this carbon and standard tri-axel glass has been laminated into the substrate layers which are then later routed for the window recesses. The over hang over the side is a very important design feature. This creates shade while stopping the water in the rain from leaving streaks down the sides. Normally when I build the top I use a one and a half inch foam core, into which the stringers, cleat for canvas track and ribs are integrated. Through this intergrated form the conduits for the wiring harnesses are laid. It is important to note as I have made this mistake before, that radar cables tend to be thicker than standard co-axial. so you might need to run a second conduit if there is to be an additional drop down display for a radar screen. Adding an instrument box is also a good idea for all the connections. Boom gallows and hatches are also features I have routinely added. there is not much more work in the boom gallows and they enable you to hide the structural elements behind a functional piece of teak or formed arch. 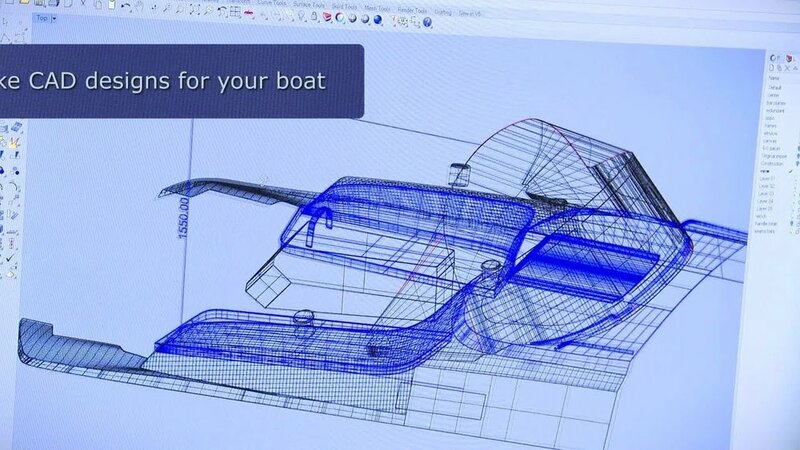 Please, remember the most important part of the fabrication process is the initial design and the boat owners bucket list. Once the fabrication process has started it is almost impossible to add a hatch or and additional conduit for wiring in another piece of equipment. Personally it does not get better than a rigid dodger well designed and fabricated. They last forever and increase the value of a boat .